Historic buildings and an old fishing boat adorn the landscape of Battle Island at Battle Harbour in Southern Labrador, Canada. As the fog encompasses Battle Island, the historic buildings built on the sloping hills and an old fishing boat decorate the landscape. 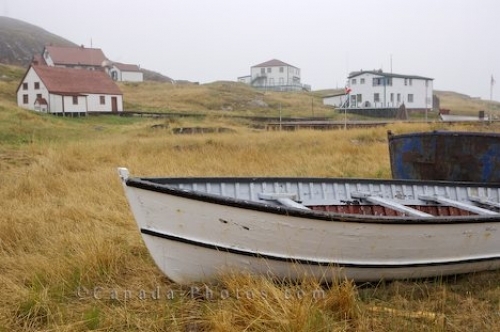 The fishing boat was used by fishermen back in the early 18th century when the cod fishery was operating. Some of the buildings at Battle Harbour are filled with historic exhibits from the cod fishery while other buildings have been refurbished and are now accommodations for overnight guests. A General Store is also housed in one of the buildings. Picture of the buildings and an old boat amongst the fog at Battle Harbour on Battle Island in Southern Labrador, Canada.